More than six months late, but here are notes from the combinatorial nullsetllensatz talk I gave at the student colloquium at MIT. This was also my term paper for 18.434, “Seminar in Theoretical Computer Science”. A simple graph is -colorable if it’s possible to properly color its vertices with colors. The smallest such is the chromatic number . In this exposition we study a more general notion in which the set of permitted colors is different for each vertex, as long as at least colors are listed at each vertex. This leads to the notion of a so-called choice number, which was introduced by Erdös, Rubin, and Taylor. A simple graph is -choosable if its possible to properly color its vertices given a list of colors at each vertex. The smallest such is the choice number . We have for any integer (here is the cycle graph on vertices). To see this, we only have to show that given a list of two colors at each vertex of , we can select one of them. If the list of colors is the same at each vertex, then since is bipartite, we are done. Otherwise, suppose adjacent vertices , are such that some color at is not in the list at . Select at , and then greedily color in , \dots, in that order. Näively one might expect that we in fact have an equality, since allowing the colors at vertices to be different seems like it should make the graph easier to color. However, the following example shows that this is not the case. The latter equality follows from being partite. Now to see the first inequality, let have vertex set , where is the set of functions and . Then consider colors for . On a vertex , we list colors , , \dots, . On a vertex , we list colors , , \dots, . By construction it is impossible to properly color with these colors. The case is illustrated in the figure below (image in public domain). This surprising behavior is the subject of much research: how can we bound the choice number of a graph as a function of its chromatic number and other properties of the graph? We see that the above example requires exponentially many vertices in . In particular, if then . One of the most major open problems in this direction is the following. A claw-free graph is a graph with no induced . For example, the line graph (also called edge graph) of any simple graph is claw-free. If is a claw-free graph, then . In particular, this conjecture implies that for edge coloring, the notions of “chromatic number” and “choice number” coincide. In this exposition, we prove the following result of Alon. is half the maximum of the average degree of subgraphs . 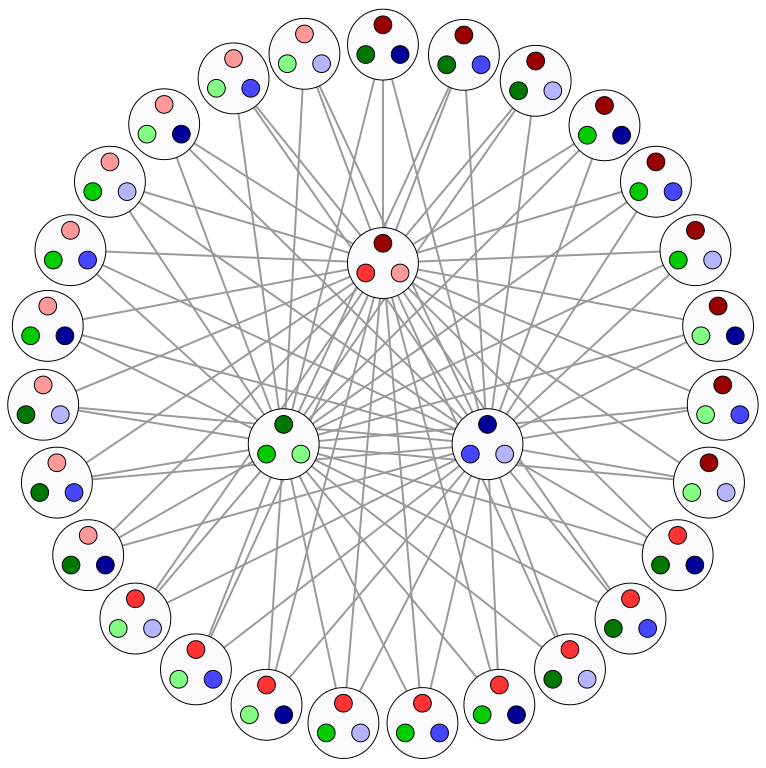 A planar bipartite graph is -choosable. This corollary is sharp, as it applies to which we have seen in Example 4 has . The rest of the paper is divided as follows. First, we begin in §2 by stating Theorem 9, the famous combinatorial nullstellensatz of Alon. Then in §3 and §4, we provide descriptions of the so-called graph polynomial, to which we then apply combinatorial nullstellensatz to deduce Theorem 18. Finally in §5, we show how to use Theorem 18 to prove Theorem 7. The main tool we use is the Combinatorial Nullestellensatz of Alon. Let be a field, and let be a polynomial of degree . Let such that for all . for every positive integer . Our proof will be an application of the Nullstellensatz. The coefficient of is . Therefore, one can select a color from each so that does not vanish. Motivated by Example 10, we wish to apply a similar technique to general graphs . So in what follows, let be a (simple) graph with vertex set . Consider orientations on the graph with vertex set , meaning we assign a direction to every edge of to make it into a directed graph . An oriented edge is called ascending if and , i.e. the edge points from the smaller number to the larger one. odd if there are an odd number of ascending edges. to the be set of all even orientations of in which vertex has indegree . to the be set of all odd orientations of in which vertex has indegree . Proof: Consider expanding . Then each expanded term corresponds to a choice of or from each , as in Example 13. The term has coefficient is the orientation is even, and if the orientation is odd, as desired. Thus we have an explicit combinatorial description of the coefficients in the graph polynomial . We now give a second description of the coefficients of . odd if it has an odd number of edges. Note that the empty suborientation is allowed. We denote the even and odd Eulerian suborientations of by and , respectively. Eulerian suborientations are brought into the picture by the following lemma. The lemma follows from this. Proof: Combine Lemma 14 and Lemma 16. Let be a graph on , and let be an orientation of . If , then given a list of colors at each vertex of , there exists a proper coloring of the vertices of . Proof: Combine Corollary 17 with Theorem 9. Armed with Theorem 18, we are almost ready to prove Theorem 7. The last ingredient is that we need to find an orientation on in which the maximal degree is not too large. This is accomplished by the following. Let as in Theorem 7. Then has an orientation in which every indegree is at most . Proof: This is an application of Hall’s marriage theorem. Connect and if is an endpoint of . Since we satisfy Hall’s condition (as is a condition for all subgraphs ) and can match each edge in to a (copy of some) vertex in . Since there are exactly copies of each vertex in , the conclusion follows. Now we can prove Theorem 7. Proof: According to Lemma 19, pick where . Since is bipartite, we obviously have , since cannot have any odd cycles. So Theorem 18 applies and we are done. This was my final paper for 18.099, seminar in discrete analysis, jointly with Sammy Luo and Ryan Alweiss. We prove that every sufficiently large odd integer can be written as the sum of three primes, conditioned on a strong form of the prime number theorem. Every sufficiently large odd integer is the sum of three prime numbers. In fact, the following result is also true, called the “weak Goldbach conjecture”. Every odd integer is the sum of three prime numbers. The proof of Vinogradov’s theorem becomes significantly simpler if one assumes the generalized Riemann hypothesis; this allows one to use a strong form of the prime number theorem (Theorem 9). This conditional proof was given by Hardy and Littlewood in the 1923’s. In 1997, Deshouillers, Effinger, te Riele and Zinoviev showed that the generalized Riemann hypothesis in fact also implies the weak Goldbach conjecture by improving the bound to and then exhausting the remaining cases via a computer search. As for unconditional proofs, Vinogradov was able to eliminate the dependency on the generalized Riemann hypothesis in 1937, which is why the Theorem 1 bears his name. However, Vinogradov’s bound used the ineffective Siegel-Walfisz theorem; his student K. Borozdin showed that is large enough. Over the years the bound was improved, until recently in 2013 when Harald Helfgott claimed the first unconditional proof of Theorem 2, see here. In this exposition we follow Hardy and Littlewood’s approach, i.e. we prove Theorem 1 assuming the generalized Riemann hypothesis, following the exposition of Rhee. An exposition of the unconditional proof by Vinogradov is given by Rouse. and is the von Mangoldt function defined as usual. Then so long as , the quantity will be bounded away from zero; thus (1) will imply that in fact there are many ways to write as the sum of three distinct prime numbers. The sum (1) is estimated using Fourier analysis. Let us define the following. Let denote the circle group, and let be the exponential function . For , denotes the minimal distance from to an integer. The “major arcs” are subintervals of centered at a rational number with small denominator. The “minor arcs” are the remaining intervals. These will be made more precise later. This general method is called the Hardy-Littlewood circle method, because of the integral over the circle group . The rest of the paper is structured as follows. In Section 3, we define the Dirichlet character and other number-theoretic objects, and state some estimates for the partial sums of these objects conditioned on the Riemann hypothesis. These bounds are then used in Section 4 to provide corresponding estimates on . In Section 5 we then define the major and minor arcs rigorously and use the previous estimates to given an upper bound for the integral over both areas. Finally, we complete the proof in Section 6. In this section, we collect the necessary number-theoretic results that we will need. It is in this section only that we will require the generalized Riemann hypothesis. As a reminder, the notation , where is a complex function and a nonnegative real one, means , a statement about the magnitude of . Likewise, simply means that for some , for all sufficiently large . In what follows, denotes a positive integer. A Dirichlet character modulo is a homomorphism . It is said to be trivial if ; we denote this character by . By slight abuse of notation, we will also consider as a function by setting for and for . The Dirichlet characters form a multiplicative group of order under multiplication, with inverse given by complex conjugation. Note that is a primitive th root of unity for any , thus takes values in the unit circle. and thus form an orthonormal basis for functions . However, the error term in these estimates is quite poor (more than for every ). However, by assuming the Riemann Hypothesis for a certain “ -function” attached to , we can improve the error terms substantially. Let be a Dirichlet character modulo , and assume the Riemann hypothesis for the -function attached to . Theorem 9 is the strong estimate that we will require when putting good estimates on , and is the only place in which the generalized Riemann Hypothesis is actually required. We will need the following fact about Gauss sums. For any modulo , . We finally require Dirichlet approximation theorem in the following form. In this section, we use our number-theoretic results to bound . First, we provide a bound for if is a rational number with “small” denominator . where denotes the Möbius function. We then provide a bound when is “close to” such an . Thus if is close to a fraction with small denominator, the value of is bounded above. We can now combine this with the Dirichlet approximation theorem to obtain the following general result. Proof: Apply Lemma 14 directly. for brevity in this section. Recall that we wish to bound the right-hand side of (2) in Proposition 5. We split into two sets, which we call the “major arcs” and the “minor arcs.” To do so, we use Dirichlet approximation, as hinted at earlier. These will be the major arcs. The union of all major arcs is denoted by . The complement is denoted by . Equivalently, for any , consider as in Theorem 12. Then if and otherwise. is composed of finitely many disjoint intervals with . The complement is nonempty. Proof: Note that if and then . In particular both and are measurable. Thus we may split the integral in (2) over and . This integral will have large magnitude on the major arcs, and small magnitude on the minor arcs, so overall the whole interval it will have large magnitude. First, we note the well known fact . Note also that if as in the last section and is on a minor arc, we have , and thus . As such Corollary 3.3 yields that . using the well known bound . This bound of will be negligible compared to lower bounds for the major arcs in the next section. Now, we can do casework on the side of that lies on. If , we have , and , because certainly we have . If on the other hand , we have obviously, and . Consider the set of integers with . We must have , and for each such there are at most possible values of . As such, . where the sum is over primes . This finishes the proof. Apparently even people on Quora want to know why I transferred from Harvard to MIT. Since I’ve been asked this question way too many times, I guess I should give an answer, once and for all. There were plenty of reasons (and anti-reasons). I should say some anti-reasons first to give due credit — the Harvard math department is fantastic, and Harvard gives you significantly more freedom than MIT to take whatever you want. These were the main reasons why transferring was a difficult decision, and in fact I’m only ~70% sure I might the right choice. Ultimately, the main reason I transferred was due to the housing. At MIT, you basically get to choose where you live. All the dorms, and even floors within dorms, are different: living on 3rd West versus living on 5th East might as well be going to different colleges. Even if for some bizarre reason you hate 90% of the students at MIT you can still have a fantastic social experience if you’re in a dorm you like. In freshman year, you are assigned a random dorm, and eat in a segregated dining hall (Annenberg) exclusively with freshman. All students are placed on a mandatory unlimited meal plan, I guess to discourage them from eating out. After freshman year, you get a random House, and eat in a dining hall built into the House. There are restrictions that make it deliberately difficult to eat at other Houses. The result of this random mixing is that (a) you only know people in your own year, and (b) zero dorm culture. Lounges are deserted, doors are shut, and people are unfindable — in fact I still don’t know the names of the students who lived next door to me. This a bigger deal than people give it credit for: students are busy and campus is large, so you don’t really see someone unless you share a class, live near them, or date them. For example, I rarely talked to James Tao, even though we’d known each other for three years beforehand and had plenty in common. The problems I mentioned were worse for me specifically since I took exclusively upper-level math courses. My classmates were all upperclassmen who all already knew each other and ate/lived elsewhere. For my own meals, the typical Annenberg conversation was either classes or gossip, so I had little to say to the other freshman (if I talked about my classes I sounded like a showoff). I was often sitting alone in my room, which was great for learning category theory but not so much for my mood. I ended up moving in to an MIT dorm for a good chunk of the school year, where it was much easier to find people I could relate well to (because they all lived in one place). At Harvard I was constantly isolated and bored. I got sick of it and left.